Ships from and sold by evokem in easy-to-open packaging. Ships from and sold by evokem. Ships from and sold by IGoodseller. 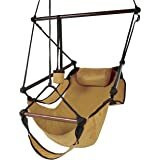 Best Choice Products is proud to present this brand new Hanging Hammock Chair. 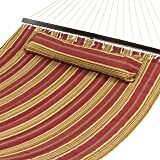 Relax outside and enjoy the fresh air with this hammock chair. 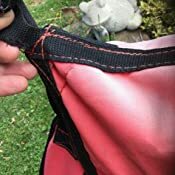 It's made of durable weather resistant 600D double layer nylon that makes it perfect for indoor or outdoor use, and will make it last for years to come. 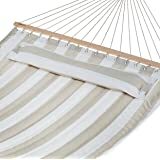 It is comfortable enough to keep you relaxed for hours and has a 250 lbs. weight capacity. 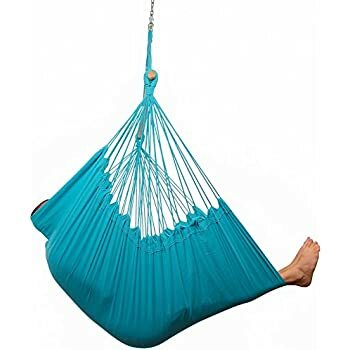 This is not the typical hammock you see everywhere else. This hammock chair includes arm rests, a foot rest, a cup holder, and a pillow to rest your head. 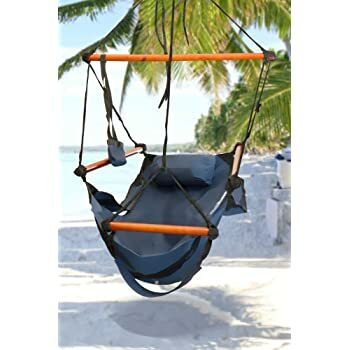 It is constructed of a 1” layer of nylon webbing around all the edges, 12 carrier round hollow braid UV protected polypropylene rope, and hardwood oak dowel that are sanded and stained with UV protection. 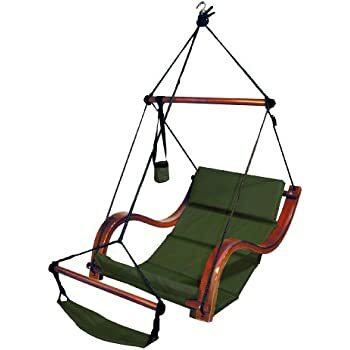 All these features prove the longevity and pristine quality of this hammock chair. We purchase our products directly from the manufacturer, so you know you're getting the best prices available. NEW PRODUCT WITH FACTORY PACKAGING.PLEASE NOTE: Our digital images are as accurate as possible. However, different monitors may cause colors to vary slightly. Some of our items are handcrafted and/or hand finished. Color can vary and slight imperfections in the metal work are normal and considered evidence of the hand-finishing process, which adds character and authenticity to those items. 1.0 out of 5 starsAnother crash report with a hard landing. This is a very comfortable chair. Until is lands you hard on the ground. I'm glad it happened to me and not someone that would sue me if they got hurt by it. Two of the fabric loops that hold the chair to the wooden dowels broke loose. I'm glad it was two on the bottom instead of the two holding the back or I would have been sent tumbling over backwards. As it is I was just set down hard from a couple of feet in the air. I have included pictures of the busted attachment as well as the attachment at the top. As you can see it is frayed as well. I used it lightly the autumn I got it two years ago then stored it inside during both winters. I basically got one full summer out of it. 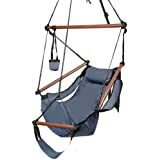 I would suggest anyone that owns this chair to check it over thoroughly for frayed connections or dry rot before use. 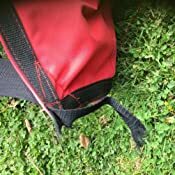 1.0 out of 5 starsIt will fall apart and the seller will not warranty it at all. The chair looked great and was just like one I had purchased in Mexico years ago. 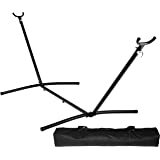 I set up the chair and on the first use the arm tore loose from the seat and was no longer useable. I am a big guy but I do weigh less than the 250 lbs the chair is rated for so there was no reason for the failure other than poor workmanship. I contacted the company (Best Choice Products) and asked for a replacement. 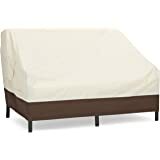 They informed me that the chair had a 30 day warranty and that since they start the warranty the day you place your order then my warranty had just expired even though I had only had the chair for three weeks. 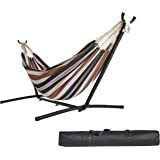 What kind of rip-off is this and why would Amazon let companies who do business like this on their site? DO NOT PURCHASE ANYTHING FROM BEST CHOICE PRODUCTS!! They will not honor any warranty. 5.0 out of 5 starsI love this thing. Read me! Important Info here. I love this thing. Especially for the price! Now, people complain about it not lasting a long time when you leave it outdoors. Here's an idea. When winter hits, BRING IT INSIDE! And if you live in the desert, maybe toss a cover around it when not in use. When its going to rain, pull the bars out and wrap a big garbage bag around it. Then when you go out its dry and ready to sit in. The only issue i see is people not taking care of things. Ok, I'm 6'2 and its easy for me to reach up and unhook it. But with a small stool that holds a planter close by... get the idea? As for the wood poles slipping out. I dont have the page to look up his name but CHEERS to the Gent that suggested a screw in the end of each. I used the shortest available dry wall screws and it works PERFECTLY! Good on ya buddy! Just make sure you get them in straight. you can always pull them out again but why chew up the wood right? I am 6'2. 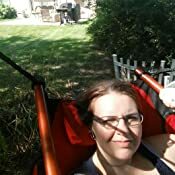 I put a small chair cushion in the seat first to lift me up a bit so I dont get squished at the width and at just under 200 lbs, I feel safe sitting cross legged and rocking back and forth in it. Has not even thought of failing me. However, i do need to dab a lil grease on the hook. That ever so little rubbing sound when meditating is driving me nuts. My kids sit in these chairs all of the time (except right now they found a spider web in one of them, so they're ready to burn the entire porch down to kill the spider - I told them we should just find the spider and remove the web - they are terrified of spiders). 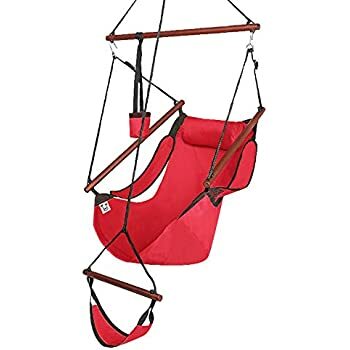 One son has a red one and one has a blue one, they both have foot rests and the one we bought here on Amazon has a cup holder with it too, this is where my oldest son sticks his hand when he's sitting in it. The red one has a pillow too, but it sits above my 9-year-olds head, so he can't really use it - even though my youngest son was mad that his didn't have a pillow (that he wouldn't have been able to use either). 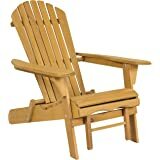 This " WAS " such a comfy chair..with 2 artificial knees and a fused ankle..this was the chair for me. 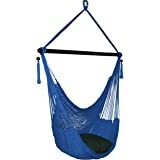 Have a large tree with 6 different hammock swings for my husband and all the neighbors to sit in and relax. my drop in front of all to see. Right away a friend looked at the shredded material. and why file a claim with the manufacturer I do not want a repeat of the crash. We bought 4 of these chairs 2 years ago and hung two. The first two lasted two years before the ropes broke. Hollow core nylon rope should last for years. We hung chair #3 two weeks ago and it broke tonight. None of them have ever had anyone weighing anywhere close to the weight limit sitting in them. They were not hung in direct sun. We loved them at first but are very disappointed that they did not last very long. We will not be hanging the 4th chair as we don't want anyone else to get hurt on them. We wish the rope quality was better. 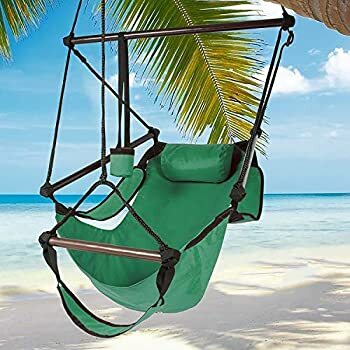 I received this as a replacement chair, because the are fun on a summer evening. It served me well, as a daily perch. However, I apparently wasn't checking the cables enough. 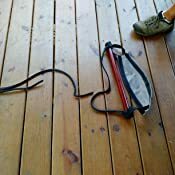 The upper rope gave out and I was unceremoniously dumped on to the porch. If you get this, dont make the same mistake! I am a smaller frame (5'3"), though Dad fit comfortably (6' or so). My husband and I installed this on our front porch and love the anti-gravity suspended feeling; it's like a one person hammock. I'd seen the chairs on display at the Ohio State Fair and had been very nearly hooked even then; this purchase and price were just what I needed. The "cup" holder is best suited for a standard size bottle or can, and the pillow makes the chair comfortable enough for a nap! Some feedback: be careful of letting the wind catch it--it becomes like a giant sail. We take ours down off the hook when not in use on our western exposure. Also, the fabric has faded significantly with just one season's exposure to the sun. If I had it to do over again I would apply a Scotchguard-type product right away to forestall fading.